Situated in northeastern Fujian Province, Ningde extends 12,900 square kilometers in area and has a population of 2,979,800 people. The best tourist time is from April to December. Ningde is highly productive, growing rice, sweet potatoes, and other produce. Its tea and oil tea output tops the list of that from other parts of Fujian Province, and Gutian, known as a "home of tremella," produces the largest quantity of tremella in China. Ningde also produces such famous local and special products and agricultural by-products as mushroom, shaddock, carambola, litchi, longan, and wine. Its major tourist spots include Tailao Mountain in Fuding, the Liyu Stream and the Jiulongji Waterfalls in Zhouning, Zhiti Mountain in Ningde, and the Yuanyang Stream in Napping. Located in northeastern Napping County, the Yuanyang Stream is a national scenic area and the only mandarin duck nature reserve in China. The mandarin duck is a lovable bird under the second-class state protection. The stream flows for 14 kilometres. The secluded hills with a dense growth of trees in the vicinity are a fine habitat of the mandarin duck. The scenic area is composed of the Baishui Stream, Yuanyang Stream, Chaxi Stream, Shuizhu Stream-Kao Stream, and Yuanyang Lake tourist zones. It overlooks Qingchuan Bay in the East China Sea, 45 kilometers from urban Fuding on Fujian@,@s border with Zhejiang Province. The mountain has a unique scenery with the sea extends to the foot of the mountain. 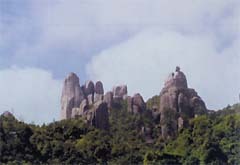 Tailao Mountain, known as an "abode of immortals on the sea," features granite peaks and caves. It is a major natural scenic attraction merging the mountain, the sea, streams, and manmade landscape into an organic whole. A provincial-level scenic area, Zhiti Mountain stands 50 kilometers to the northwest of Ningde City. It is composed of the Zhiti Wonderful Scenery, the Surging Sea Swashes Against Yingzhou Isle, Huotong Cave, and Naluoyan Grotto. Designated as a provincial-level scenic area, the waterfalls flow in a deep gorge flanked by steep peaks 13 kilometers southeast of the Zhouning county seat. The waterfalls cascade downhill for 1,000 meters in the gorge to form nine tiers with a total drop of 300 meters.